There was much sadness in Longford and beyond recently as gifted footballer and renowned showband performer, Paddy Hanrahan, was laid to rest at Kilmahunna cemetery, Lusmagh, Co Offaly on Sunday, March 31. Clonguish remain the only club in Longford to have captured the Sean Connolly Cup four years in a row, 1962, ‘63, ‘64 and ‘65, and the late Paddy Hanrahan has the distinction of accepting the coveted silverware on each of those four occasions. Reigning county and provincial club kingpins, Mullinalaghta St Columba’s, captained by Shane Mulligan, will be striving to equal Clonguish’s record in the 2019 Peter Hanley Motors Longford senior football championship race. Hailing from Clondra, Paddy, who celebrated his 79th birthday on St Patrick’s Day, passed away peacefully at his home in Lusmagh on March 28. He is deeply regretted and sadly missed by his wife Mary and son Aidan, his granddaughter Olivia and Aidan’s partner Margaret, sisters Breege, Evelyn, Claire and Agnes, extended family and friends. Though living in Lusmagh for many years, Paddy's roots were firmly entrenched in the soil of his native Longford. His late father was a national school teacher in Clondra and Paddy began his gaelic football career, lining out with St Brigid’s Killashee. Football and music were among his greatest passions. Paddy went on to win six county senior championship medals with Clonguish and he was vocalist with The Sahara Showband in the late 1960s and early 70s, and he also fronted the Paddy Hanrahan and Oklahoma showband. Drumlish country music star Declan Nerney was still at school when he got his first gig, in 1973, with Paddy Hanrahan and The Oklahoma Showband. Declan described the late Paddy as a gentleman. “I was very saddened by the news of his death. Paddy gave me my first job in his band,” he said in a tribute posted on Facebook. Paddy was very popular around the midlands music circuit and he enjoyed considerable success with songs like The Dixie Cannonball, Where the River Shannon Flows and Barely Beatin' Broken Heart. Nominated on the Booker shortlist, for The Butcher Boy in 1992 and Breakfast on Pluto in 1998, writer Patrick McCabe, who worked at St Michael’s Boys National School, Longford from 1974-78, played keyboards with Paddy Hanrahan and The Oklahoma Showband. In an interview with the Irish Times, McCabe recalled, “I was playing with Paddy Hanrahan and the Oklahoma Showband - haring round the country and teaching at the same time. And I kind of weighed up the way showband men lived at that time, maybe playing in the Gresham on Holloway Road or the National in Kilburn and up all night drinking with the ballroom owners and other musicians. And at that time it was pints of Smithwicks and double Pernods all night. For many years, Paddy worked as a fitter with Bord na Móna in Lanesboro and colleagues remembered him fondly as a true gentleman. 1996 All-Ireland senior hurling championship final referee and current Offaly GAA County Board secretary, Pat Horan, recalled how Paddy, following his move from Longford, ‘played many a Sunday night in the Brosna Lodge’ in Banagher. 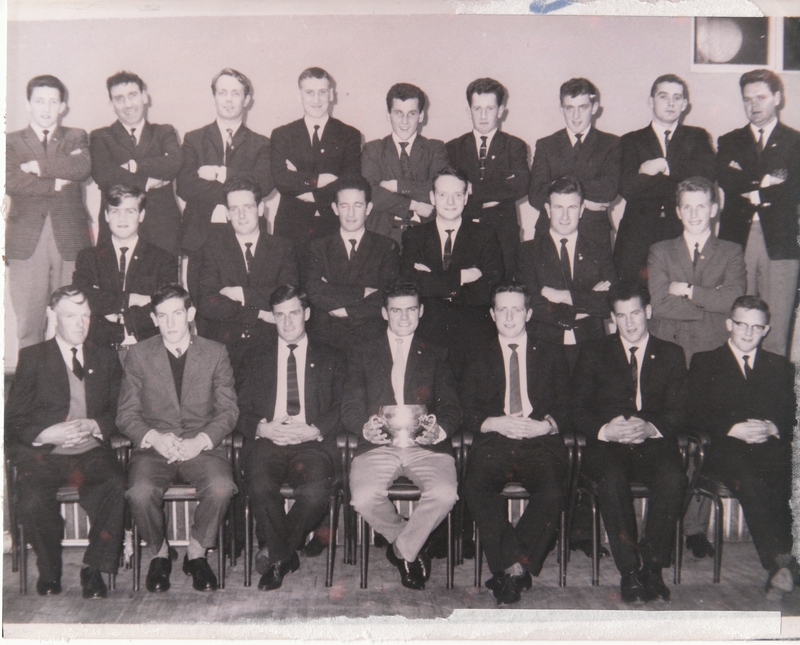 Photo: Clonguish, 1964 Longford senior football champions, with the Sean Connolly Cup. Front row l to r; Bertie Allen, Kevin Doyle, Brendan Barden, Paddy Hanrahan (captain), Gene Flynn, Donal Smith and Maurice Murphy. Middle; Jimmy Flynn, Seamus Flynn, Mick Hopkins, Liam Flynn, PJ Murphy and PJ Moolick. Back; Brendan Murphy, John Joe O’Reilly, Oliver Barden, Eamon Barden, Willie Gallagher, Gerry Hopkins, Pat Burke, PJ Monaghan and Johnny Flynn. Clonguish GAA also paid a poignant tribute to their iconic team captain from the sixties. Expressing deep sadness, they described Paddy as ‘a club legend and a fantastic servant to the club’. The tribute read: “A gifted player, Paddy was a key member of the club's golden era during the 1960s. “In a time of very physical football, Paddy stood out for his footballing skills. Although not the tallest man on the field, he was renowned for his high fielding and he formed a formidable partnership during this era with the great Jimmy Flynn. “Most notably, Paddy holds a distinguished record of captaining the team to each championship win during the 4 in row period from ‘62-65. Clonguish defeated St Mary’s Granard in the 1962 county final (2-10 to 0-9), while they got the better of Longford Slashers in the finals of 1963 (2-7 to 1-4) and ‘64 (1-10 to 1-2). They completed the 4 in-a-row by defeating Granard once again (0-11 to 2-4). Many of his football team mates, and also those he lined out against, made their way to Lusmagh and St Cronan’s Church over the weekend to pay their final respects to Paddy, who was regarded as one of the top club footballers in Longford throughout the 60s. Paddy certainly passed on his passion for the GAA to his son Aidan. Winner of a Leinster U-21 hurling championship medal in 2000 with Offaly, Aidan was also part of the Offaly senior hurling squad from 2000 to 2006. He was a key player for local club Lusmagh (which produced All-Ireland medal winners Joachim Kelly, Brendan Bermingham, Brendan Kelly and the Troy brothers, Jim & John) and he also played senior football championship with neighbouring St Rynagh’s. A highly regarded coach, Aidan managed Offaly U-21 hurlers in 2012 and ‘18, and last year, he served as an Offaly senior selector alongside current manager Kevin Martin. This year, Aidan is managing Limerick club side, Doon. Paddy’s determination ensured he could rub shoulders with the best on the football pitch and his beaming smile and singing talent endeared him to music fans everywhere. He will be sadly missed by all who knew him. Paddy reposed at his home last Saturday, with removal to St Cronan’s Church, Lusmagh on Sunday, March 31. Following requiem mass, he was laid to rest in Kilmahunna cemetery. Predeceased by his parents, and by his brother Michael and his sister Rita, deepest sympathy is extended to Paddy's wife Mary and son Aidan, his granddaughter Olivia and Aidan’s partner Margaret, sisters Breege (Kenny), Evelyn (Creamer), Claire (McElvaney) and Agnes, nieces, nephews, extended family and friends. R.I.P.